International Women’s Day, originally called International Working Women’s Day, is celebrated on March 8 every year. It commemorates the movement for women’s rights. The earliest Women’s Day observance was held on February 28, 1909, in New York and organized by the Socialist Party of America. On March 8, 1917, in the capital of the Russian Empire, Petrograd, a demonstration of women for bread and peace began…the beginning of the Russian Revolution. The Union of Italian Women officially declared March 8 Women’s Day in 1945. The United Nations began celebrating in International Women’s Day in the International Women’s Year, 1975. In 1977, the United Nations General Assembly invited member states to proclaim March 8 as the UN Day for women’s rights and world peace. 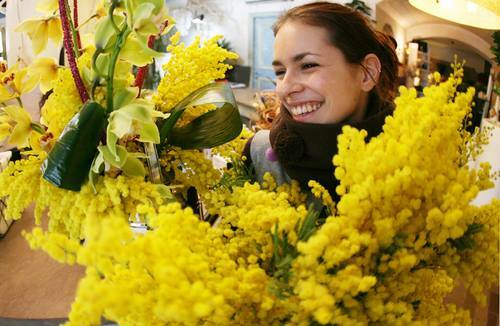 Italians celebrate this holiday with mimosa flowers, given by men to the women in their lives, or by women to their friends. An endearing tradition. Reblogged this on Journeys Viaggio.